Above photo date unknown, kindly sent by Paul Wells. 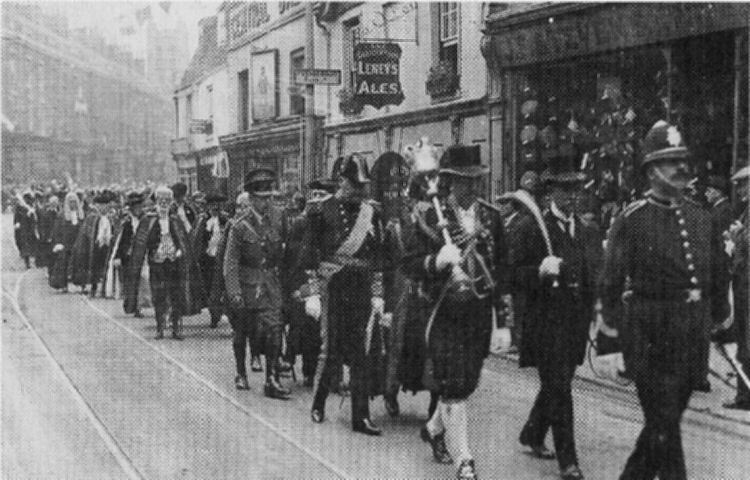 The original Salutation during a Mayors procession, 1923, showing a meeting of the Brotherhood and Guestling, attended by the Lord Warden Earl Beauchamp. Photo by kind permission of Dover Library. 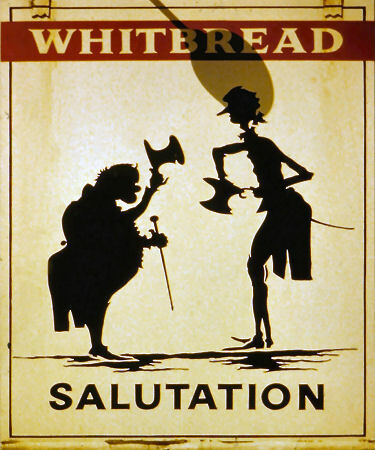 Salutation above shown on right in the early 1930s. On left can be see the "British Queen" and in the middle (same side) the "Prince Albert". Above shows the old Salutation, date unknown. Kentish Gazette Dec 28 1824. Inquest at "Salutation", Dover, yesterday morning on body of labouring man Peter Goldsack aged 83 of West Langdon, who it appeared was seized with a fit while riding in a donkey cart, from which he fell and expired. The Jury's verdict "died by the visitation of God". A numerous projeny will bewail his death, one of his sons having 16 children and another 17. From the Dover Telegraph and Cinque Ports General Advertiser, Saturday 7 January, 1843. Price 5d. An inquest was held, at the "Salutation," before G. T. Thompson, Esq., Coroner for the borough, on the body of George Hardwin, aged 49, wagoner, in the employ of Mr. C. B. Goreley. Joseph Belsey, wagoner deposed, that on Sunday morning last, about four o'clock, he, with deceased, was returning with two wagons from Margate, where we had been sent with a load on the previous day, and when opposite Victoria Crescent, deceased called out "Joe." I ran back and found him lying in the road. He said the wagon had gone over him. I then got assistance and took him to his house. When I last saw the deceased, near the Chapel at Buckland, he was walking at the side of his horses. I can not tell how the deceased came under the wagon, not do I know if he was riding on the shafts. The wagon and the horses are the property of Mr. Gorely, and the horses are very quiet. We left Margate to return to Dover about two o'clock on Saturday afternoon. E. G. Rutley, surgeon, deposed, that he was called to attend the arm of deceased broken, and great injury in the abdomen, from which there was a considerable haemorrhage. The deceased expired in about two hours. Verdict - "Accidental death, from the wheel of a wagon, with a deodand of one shilling on the same." From the Dover Telegraph and Cinque Ports Advertiser, 2 June, 1849. John Phillips jun. 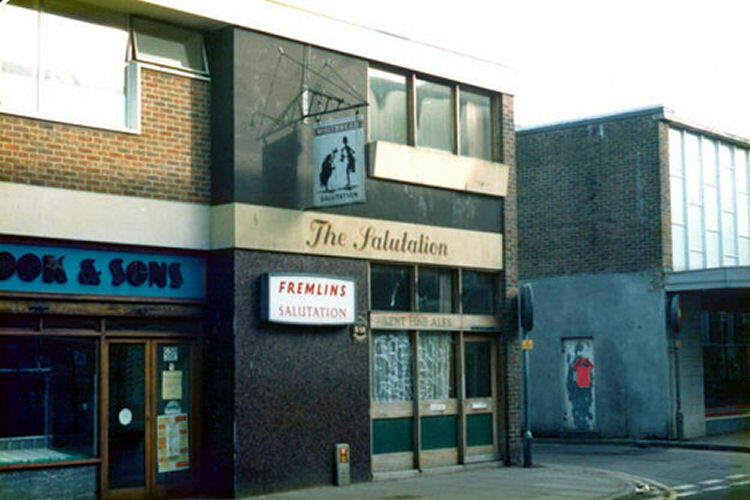 - The prisoner slept at the "Salutation" on Friday and Saturday nights last. On Sunday morning, at about eight o'clock, on going up stairs, thought I heard some one in my bed-room; and, on proceeding thither, saw prisoner in the act of opening the door to come out. Missing two shirts from a box on which I had previously seen them lying, I collared prisoner, asking him what business he had in my room, and challenged him with the theft. He partially stripped, to show that he had nothing about him, and was then allowed to leave the house. Almost immediately afterwards a pair of stockings were found concealed between the mattress and sacking-bottom of prisoner's bed, when a policeman was sent for, and the prisoner taken into custody. Seeing that my keys were disturbed on the previous night, I suspected all was not right, and had kept a look-out on the prisoner's movements. On the arrival of the policeman we went up stairs together, and he discovered two shirts of mine and a neckerchief, concealed in a corner beside the bed in the prisoner's room, which was adjoining mine. It was not the bed in which the prisoner had slept, but another bed in the same room. A jacket belonging to my father, and a shawl, were also found concealed among the bedding. No other lodger had slept in the house while prisoner was there. - This evidence, in respect to the concealment of the clothes, were corroborated by Matilda Martin, a servant at the "Salutation," and police-constable Scutt. Prisoner pleaded his innocence of the charge, and stated that he had left the house, and was near the Market Place when apprehended - Committed for trial at the ensuing quarter sessions. From the Dover Telegraph and Cinque Ports General Advertiser, Saturday, 12 December, 1846. Price 5d. From the Dover Telegraph and Cinque Ports General Advertiser, Saturday, 23 February, 1850. Hannah Clark, remanded on Friday on a charge of stealing from the “Salutation,” in Biggin Street, two old stockings, was again brought up before the Bench, but Mr. Phillips, the owner of the property stolen, declined to prosecute, the prisoner was discharged after some salutary advice from the Magistrates in reference to her future mode of conduct. From the Dover Telegraph and Cinque Ports General Advertiser, Saturday, 6 February, 1858. By direction of the Executor of the late Mr. Matthias Rigden Kitham. 1. That well known Inn or Public House called the "Salutation," with the stabling for ten horses, outbuildings, ground, and appurtenances belonging, thereto, with room for four cottages, or other buildings, behind the same, situate in Biggin Street, Dover, now occupied by Mr. Thomas Eves. This property has been an established Inn for centuries and is well situated for a very extensive business. From the Dover Express and East Kent Intelligencer, 9 September, 1865. Price 1d. Robert Houghton, a young fellow in the uniform of the Royal Artillery, was next placed at the bar, having been found on the premises of Mrs. Exes, "Salutation Inn," Biggin Street, and being suspected of an unlawful purpose. It appeared that the defendant had been found at two o'clock in the morning in one of the upstairs apartments, after the whole of the family had gone to bed; and as he had been unable to give a satisfactory account of himself he had been given into custody. Supt. Coram said, in answer to the Bench, that there was no reason to suppose the defendant intended to commit a felony, and the only reason he had been given into custody was because he was unable to give anything like a satisfactory account of himself. From what he had since ascertained, he believed the defendant was paying a visit to the servant girl. Police-constable Company, who had taken defendant into custody, said he must have scaled the front of the house and got in at one of the upstairs windows, which had been left open. A sergeant of the defendant's battery, who was in attendance, said the defendant was a good, steady man, and had never been in custody before. The defendant said he had been at the "Salutation" all the previous evening, and he believed he must have returned at the time he was found as described in search of his gloves, which he had missed after leaving the house. He had taken a great deal to drink, and was hardly aware of what he was about. Sir Luke Smithett asked the defendant if he knew anything of the servant girl? Defendant admitted, with some show of reluctance, that he had spoken to her in the course of the previous evening. The Sergeant, in reply to the Magistrates, said the defendant would be punished by the military authorities for being absent from his quarters. He had had a pass which extended to 12 o'clock only, and he would therefore be punished for being absent without leave. Under these circumstances the Magistrates cautioned the defendant and handed him over to the military authorities. From the Dover Express and East Kent News, Friday 21 June, 1867. A letter was read from Mr. Archer, of the "Salutation," stating that damage was done to his property in pulling down the forge in Biggin Street. he stated that he had mentioned the matter to the Surveyor and expected that compensation would have been allowed. The Town Clerk said this was the first he had heard of a claim for compensation, and had requested the claimant to put it in writing. The matter was referred to the town Clerk. From the Dover Express and East Kent News, Friday, 11 August, 1871. Price 1d. John Pratt, a man in the employ of Mr. Stiff, builder, was charged with being drunk and disorderly and with causing an obstruction of the footway in Biggin Street, on the previous Saturday evening. Police-constable William Corrie deposed: On Saturday night last, at about a quarter to eleven, I was on duty in Biggin Street, when I saw the prisoner in front of the “Salutation.” There was a crowd of people round him, and he was standing in the middle of the footway with his coat off, wanting to fight. I tried to get him to go away, but he would not go; so with the assistance of Police-constable Bowles I took him to the police station. He was very drunk and exceedingly violent. The prisoner was very sorry for the offence. He had had some drink, and he really did not know what he was about. He had on the previous Monday commenced to work in this town for Mr. Stiff. The constable said he was very violent on the way to the police-station, and he had to handcuff him. His behaviour at the station-house was also bad. Superintendent Coram said he knew nothing of the prisoner, except that he was in the employ of Mr. Stiff. The Magistrates: You see what trouble you have brought yourself by indulgence in drink. In addition to the punishment you receive here, you are likely to lose your employment. You will be fined 10s., including costs; or, in default, seven days' imprisonment. The prisoner paid the fine. From the Dover Express and East Kent News, Friday 13 February, 1874. Mr. John Johnson, tailor of New Bridge, Dover, was thrown from a vehicle in High Street, Dover, on Monday evening, and on Tuesday, after lying a little over twelve hours in an unconscious state, died from the injuries he received. The news of the event caused general regret in the town, where Mr. Johnson was well known and highly respected. An inquest, to enquire into the cause of the accident was held on Wednesday, at the “Salutation Inn,” Biggin Street, before W. H. Payn, Esq., Coroner, and a jury comprising of the following gentlemen:- Messrs. J. Joyce (foreman), John Canham, Henry Harris, William Young, Thomas Wright, Thomas Lester, Abel Southby, William Buckland, Frederick Smith, Richard Freeman, Charles Hadlow, Robert White Adams, John Rowe Adams, and Edward Richard Worger. Mr. William Wrichtson, tailor, Townwall Street, said: I have know the deceased, of whose body we have had the view, many years. His name is Hohn Johnson, he was a tailor, carrying on business I Dover, and was 57 years of age. Charles Bliss, stableman at the Castle Street “Antwerp” stables, said: On Monday night last the deceased, Mr. John Johnson, and Mr. Newman came to our stables a few minutes before ten o'clock, and got up into a mail phaeton belonging to Mr. Churchward, and started off all right. I can swear that they were both quite sober. The horse was a quiet animal, for I had known him years. Soon after I heard that an accident had occurred. By the Foreman: I took a fly but I did not remove the deceased or Mr. Newman. I took young Mr. Johnson home. Ellen Wells, wife of Henry Wells, fisherman, said: On Monday night, about five minutes past ten o'clock, I was going to the “Turnham Green” for porter when I saw two gentlemen in a carriage. The horses were galloping very fast; it appeared as though they were running away, and the wheels seemed not to touch the ground. I saw one gentlemen fall off the carriage upon the road. I went to the gentleman who had fallen and found it was Mr. Johnson. I turned him over and called for help. I thought first that a piece of the bridle was in his mouth, but it was one of his teeth loose. Sergeant Johnstone of the Police Force came with a lantern in a few moments. The deceased was bleeding very much from the back of his head, and from his mouth and forehead. By the Jury: The horse and carriage continued its course after the deceased fell. I know nothing about Mr. Newman. By the foreman: The road was quite clear when the deceased fell out. The carriage did not seem to be checked in any way. It was going very fast. Sergeant Johnstone said: I belong to the Dover Police. About 10 p.m. I was on duty at St. Mertin's Terrace opposite Ladywell, posting the night men for duty when my attention was called to a trap that had run away. I turned round to see when it was passing the foot of the steps of the Town Hall. It was running at a great speed, and I could see that there were two gentlemen in it. When it got opposite to me the man on the Ladywell side was pulling the reigns back with all his might, and the gentleman on his left seemed to have hold of the reins too, by the position in which he was sitting; he was leaning on his right side. I did not know either of the two gentlemen at the time. I said to Police-constable Bath. “The both cannot hold her in.” I told the men to step out as there might be an accident. When I got to Mr. Ralph's the chemist, I could hear nothing of the trap, but I saw two or three people in the middle of the road, and I heard a groan, I said to the men, “Run, there is someone hurt.” On the further side of the “Turnham Green” public-house I saw a gentleman who had fallen; he was insensible. I left him in charge of P.C. Bath, and I went a little further and saw another gentleman lying on the pavement. I could not tell who either of them were. My attention was most called to Mr. Johnson, and I could not tell who he was till we got him to the Hospital. The other man, Bath, brought Mr. Newman to the Hospital, Dr. A. Duke and Mr. Grandison were immediately in attendance. As the colour began to return to Mr. Johnson's face I recognised him and told Dr. Duke that it was Mr. Johnson, of Newbridge. Dr. Duke recognised the other man as Mr. Newman, of Bushy Ruff. By the Foreman: The men, when I saw them, after they had fallen, were about three yards apart. William Kennett, a watchman, said: On Monday night I was on duty near the Town Hall, where there are excavations in the street. About five or ten minutes after ten o'clock I heard a trap coming along Biggin Street as fast as it could come. It passed by me all right. I got out of the way and did not try to stop the horses. I noticed that there was a man hanging back at the reins. I did not see the accident but shortly afterwards I heard of it. I am satisfied the horse had bolted before he came up to my light. I said to myself “Here's somebody coming faster than they ought.” I had a red and a white light. Mr. A. Grandison, home surgeon of the Dover Hospital said: On Monday night about ten o'clock the deceased was brought into the hospital with another gentleman. I arrived five minutes after they were brought in. I saw Mr. Johnson lying on the bed. I saw it was a very bad case, and I at once sent for Mr. Osborne, who was surgeon for the week. We found a large contused wound at the back of the head, a slight bruise on the left side of the forehead and the left side of the head. The wound on the back of the head was dressed. He was bleeding from the nose and his breathing stertorus. He vomited blood; that was blood which had flowed down into his stomach. He had all the symptoms of compression of the brain. He lingered till half-past eleven the next morning when he died. He never spoke at all. The Coroner in summing up the evidence, said the cause was a most melancholy one illustrating that uncertainty of life, but he could not see that there was any other course for the Jury but to return a verdict of accidental death. He said that he was speaking to Mr. Johnson about 20 minutes before the accident occurred and was rather inclined to get up with him. The portion of the reins which were found in Mr. Newman's hands were examined by the Jury, and it was their unanimous opinion that it should be recorded that the death was accidental, but at the same time the Jury were of opinion that the reins were untrustworthy. Mr. Newman, in whose hands the portion of the broken reins were found, was too ill to attend to give evidence; and from enquiries made this day we learn that Newman is progressing very slowly. From the Dover Express and East Kent News, Friday, 10 December, 1875. Price 1d. Fergus Flaherty said: I am an engine driver in the employ of the South Eastern Railway, having been engaged 23 years. Last Monday I was driving an engine between Dover and Folkestone from six in the morning till ten at night. About 7.20 in the evening I was coming from Folkestone, nearing Dover. When we reached the Archliff Fort tunnel I saw several red lights ahead of me. We still proceeded about 3 miles an hour. I was struck then by a carriage on the left side of the engine, midway between the engine and tender. It was at a crossing that this occurred. Fabb the deceased was on the engine at the time, and he was struck off the engine by the carriage. He was on the engine to give instructions how to proceed. He was a deputy foreman of the permanent way department. He was in office in consequence of the block on the line. I next saw him lying in a hut on a form. The carriage that struck my engine was the first of an empty train that was being propelled by an engine at the end nearest the station. I saw the carriages or rather a red light on the carriages in the down tunnel, but I did not expect they were coming on to strike me in the position that I was in. I was conveying men and materials between Lydden Spout, cutting on a blocked line. The line was blocked between Dover and Folkestone by the snow. I had one brilliant red light on the front of my engine when it was struck. The person in charge of the train ought to have seen that light. Just as the accident occurred the deceased was saying, “ I will go now and see the signalman and block the road up for the night.” He was in the act of leaving the engine when he was struck by the carriage. In fact he was on the steps of the engine when he was struck. Deceased was 41 years of age. There were from 20 to 25 men on the engine, they having done their work for the night and were going home. William Eatall, shunter, said: I am employed by the South-Eastern Railway Company at the Dover station to shunt all trains that arrive from the arrival to the departure shed. I was engaged in this work on Saturday night, a little before seven o'clock to shunt a train that had just arrived from London. Before I shunt out I have to get a signal from the switchman at the Dover end of Archliff Fort tunnel. I took the signal from him with a green light, and then went to the arrival shed and told the driver “All right.” We cross over from the down road to the up. The driver shouted out and I was on the off side of the carriages. We proceeded till we ran into this engine where the accident occurred. I saw no light at all until we stopped. I could not have seen the red light on the engine if there had been one, as my place was on the off side. I did not see anything of the accident except that I found the engine had run into something. I at once went and told Mr. Dyne the station master. Robert John Algernon Dobbie, a member of the Royal College of Surgeons and a licentiate of the Society of Apothecaries, said: I am house surgeon at the Dover Hospital. On Monday evening between eight and nine o'clock I admitted the deceased as an in-patient. He was suffering from severe lacerations of the scalp, having six wounds, one of which denuded the bone, and also from a fracture through the hip bone. He was suffering from a shock which increased and he died at 11.03 the same night. The cause of his death was shock from these severe injuries. Daniel Virgo said: I work for the South-Eastern railway Company as a labourer. Last Monday evening I was clearing snow away from the Dover side of the Shakespeare's Cliff tunnel. About seven o'clock I saw a red light in the tunnel, it was very dim, and I could scarcely make out whether it was a red or a white light. Immediately I heard the engine whistle and an engine with a lot of men on it came out of the tunnel. By a Jurer: It was the steam in the tunnel that made the light dim? William Francis Lightfoot, switchman on the South-Eastern railway at Dover, said: Between six and seven o'clock on Monday evening I was on duty. It was my duty to give a signal for shunting the train that had come from London. I did so by showing a green light. I gave that signal because the line was clear. Before doing that, I looked up the both lines and seeing no light on either I signalled the line clear. At the same time, previous to giving the signal, I called to the signalman Crowser to say I was going to shunt out the empties, and he replied, “All right.” If he had seen an obstruction of course he would have told me of it. There was the length of Archliff Fort tunnel between me and the signalman. By a Juror: I did not hear the engine blow a whistle in coming out of the tunnel or see any light. Evidence continued: After the empty train was gone I heard a crash and I thought the snow had thrown thee train off the line. I went forward, and found an engine blocking the cross-over road and there was no head light on the engine. By a Juror: I do not think the shock had put the light out. The carriages had been shaken more than the engine and there was a beautiful light on the carriages. I called the attention of the driver to the circumstance that there was no head light, and he said it had been knocked off. I said it was not knocked off for there the lamp was, and there was no light in it. The Coroner: Do you think the shock put the light out? Witness: It might have done, but I do not think so. I saw a man light the lamp a few minutes after. It was a red light. Filmer Crosier, signalman on the South-Eastern Railway at Dover, said: On Monday last, about eleven o'clock in the evening, I was on duty at the Archliff Tunnel signal-station. I was aware that an empty train that had arrived from London was being shunted. I told the switchman that it was all right. I was satisfied that the road was clear. I had looked up the road to see if there were anything coming, and found all clear. I told him all right. I could not see or hear anything. The empties came out of the station and passed me, and then I heard a collision between those empties, and an engine which had come down. There was no light on the engine that came down; I am certain of that. I went to the engine at once, and I called out to them, and told them they had got no lights on the engine. The engine driver and fireman made no reply. The first one that came round the engine was a lad named Wilson, and I said this engine had no lights, and he said, “Then they must have blown out.” I then returned to my post. There was a great confusion at the time of men about. There were so many of them, that I did not see the engineman or the fireman. Charles Davis, a labourer in the employ of the South-Eastern Railway Company said: I accompanied an engine and tender from the block on the line between Folkestone and Dover. I was on the engine, I saw a red light on the engine before we started. We came into collision with the empty carriages at Dover, and I heard someone cry out, “Mr. Fabb is killed.” I did not look for the lights after we stopped. By the Juror: I heard a long whistle when we left Shakespeare Cliff Tunnel. Mr. Dyne, Superintendent of the Dover Station, was present to watch the case on behalf of the Company. The Jury appealed to him as to whether he thought it possible that the light might have gone out accidentally, and he said it was quite possible, considering the exceptional state of the line, that a jerk might have put the light out. From the Dover Express and East Kent News, Friday, 25 May, 1877. Price 1d. Mr. Archer, landlord of the “Salutation,” Biggin Street, asked for permission to keep his house open beyond the appointed hour for closing, on the occasion of the ball to the East Kent Mounted Rifels, at the Town Hall, on Monday next. In reply to Mr. Back, the applicant said it had been granted on a previous occasion when the Yeomanry were at Dover. The request was complied with. From the Dover Express and East Kent News, Friday 29 May, 1885. Martin Hussy was brought before the Magistrates for the fifth time charged with being drunk, disorderly, and using obscene language in Biggin Street. Police-constable Cook said: I was on duty in High Street last night at half-past six o'clock. From information I received I went to the “Salutation Inn.” I found the prisoner outside in a fighting attitude, waiting for a man to come out of the public-house. I tried to persuade him to go away; he went into the “Salutation,” and was turned out. I tried to persuade him to go away again. He then threw his hat down and said he would not go away for anyone until he had fought the man. He was drunk and used very filthy language. I then took him into custody and brought him to the Police-station. The Magistrates fined the prisoner 10s. and costs, or in default 14 days. Time was given for the money to be paid. From the Dover Express and East Kent News, Friday 20 January, 1893. 1d. The Borough Coroner held an inquiry at the Town Hall on Monday respecting the death of Mrs. Caister, wife of the landlord of the “Salutation Inn,” Biggin Street, who died very suddenly on Friday. Henry Caister, landlord of the “Salutation Inn,” Biggin Street, said the body viewed by the Jury at his house was that of his wife, Sarah Jane. She was 62 years of age, and witness last saw her alive about two o'clock on Friday afternoon in the scullery. He went into the bar and in about half an hour he heard her go upstairs. She was quite well and was slightly the worse for liquor. About half-past three he heard her footsteps in the bedroom which was just above the bar. He heard nothing more of herm, and he never saw her again until 11.30 after closing. He then found her on the floor in the bedroom on her side, in a partly sitting position by the side of the bed. Witness found that she was cold and stiff. He came downstairs and went to the police station and gave information. Mr. Long was sent for and came in about ten minutes. At dinner time witness had spoken to her about having had too much to drink. He had never heard deceased threaten to do anything to herself. By a Juror: Witness said his wife frequently stayed upstairs all the afternoon and evening. Mr. A. Long, surgeon, said about half-past twelve o'clock on Saturday night he was called by Police-sergeant Campany to go to the “Salutation Inn.” He went at once and found the deceased on the floor in the position described by the last witness. Death had taken place some hours. He examined the body the next day, but found no marks of violence. The face was discoloured and congested. From what witness had heard about deceased having suffered from shortness of breath, and being very stout, witness thought that death was probably due to heart disease. Excessive drinking would be very injurious to a person suffering from heart disease. There was nothing suspicious about the case. Dover Express of 12th May 1916. Harry Weekes of the “Salutation Inn”, Biggin Street, was summoned for not carrying out the Lighting Order on April 29th. PC Brown said that at 12.15 a.m. on April 29th he received a complaint that a light was showing from the “Salutation Inn”, Biggin Street. He went there and found that a blind was not drawn. He knocked, but could not make the defendant hear. He then got a ladder and climbed up to the window, and found that a candle was alight. The defendant was in bed and witness failed to arouse him, although he did the whole neighbourhood and witness then drew the blind properly and left it. A fine of 10s was inflicted. From the Dover Express and East Kent News, Friday, 8 February, 1918. On September 14th, 1917, Henry Thomas Weeks and his wife Florence Weeks, of the "Salutation Inn," Biggin Street, were summonsed. Mr. Weeks for permitting and Mrs. Weeks for supplying intoxicating liquor to a person during restricted hours under the Board's orders, the case against Mr. Weeks was dismissed, and Mrs. Weeks was fined 40s; the house has since changed hands. From the Dover Express and East Kent News. 22 April, 1910. The death occurred early on Wednesday morning of Mr. W. L. Dalton, proprietor of the "Salutation Inn," Biggin Street, who was, until his retirement from the Army some years ago, Instructing-Sergeant-Major to the old Cinque Ports R.G.A. (Volunteers). Mr. Dalton had been in bad health for some fifteen months, and he died at the Westminster Hospital, London, where Mr. Dalton had been a patient for nearly three weeks previous to his end. Mr. Dalton was a Mason, and also a member of the Prince Arthur Lodge of Oddfellows. Dover Express 11 June 1920. RE: JOHN THOMAS BRYANT, Deceased. Notice is hereby given that all Persons having any claims against the Estate of John Thomas Bryant late of the "Salutation Inn," No. 5, Biggin Street, Dover, Kent, Licensed Victualler, deceased (who died on the 9th of April 1920, and whose Will was proved in the Principal Probate Registry of the High Court of Justice on the 18th May 1920, by Percy Frank Terson, the Executor therein named) are hereby required to send particulars thereof to us the undersigned, the Solicitors for the said Executor, on or before the 14th day of July 1920, after which date the said Executor will distribute the assets of the deceased, having regard only to the Claims of which he shall then have had notice. Dated this 5th day of June, 1920. 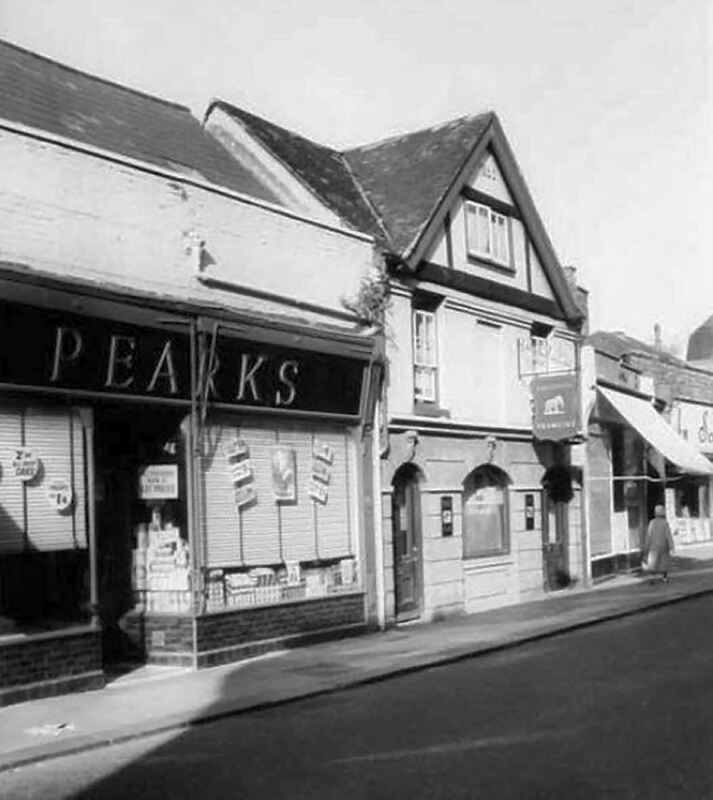 Lewis & Pain, 7, Castle Street, Dover, Solicitors for the said Executor. From the Dover Express and East Kent Intelligencer, 1 March, 1929. Price 1½d. At the Dover police Court on Monday, before Messrs. W. H. Brett, T. Francis and G. Golding. James Wyatt, licensee of the “Salutation” was summoned for supplying intoxicating liquor to ten persons (afterwards defendant) other than in permitted hours. Leslie Ralph and Mildred Ralph, of 59, London Road, Charlotte Redfern, 15, Shrubbery Cottages, Thomas H. Killiner, of 21, Buckland Avenue, George H. S. R. Mack, of 40, York Street, Albert R. B. Amos and Louisa Amos, of 219, London Road, Walter Saunders, of 88, Mayfield Avenue, Charles William Dale and Henry Dale, 47, Union Road, were later summoned for consuming intoxicating liquor otherwise than in the permitted hours. Mr. G. W. Hardman defended Mr. Wyatt, and pleaded not guilty, this summons being taken first. Mr. O'Mears, who prosecuted, said that the premises had been under observation for sometime and it was decided to visit them on January 12th. Inspector Leeming said: On Saturday, January 12th, at 10.50 p.m., I met by arrangement P.S. Pay, and P.C. 's Steele, Blaskett, McLeod and Lee. I posted Steele on the back-wall of the “Salutation” and proceeded to the front door, posting McLeod and Blaskett there. I tried the front doors and found them locked. I rang the bell and the door was opened by the defendant, to who I said, “I am going to visit your premises.” I then entered with P.S. Pay and the landlord and went into a small room at the back of the bar where I found eight persons, five men and three women, some sitting and some standing in the room. Before each of them was a glass containing for the men four of ale, one Guinness and two glasses of Port, one the property of Mrs. Mildred Ralph. I said to the landlord “How do you account for all these persons being on your premises with this drink in front of them after closing time?” he replied, “These people are my guests. I paid for the drink.” I replied, “You cannot turn your customers into guests at closing time.” At that point P.S. Pay reported that he could hear voices in a room and I instructed him to call in P.C. McLeod and go I and deal with it, which they did. I then advised the defendant to get rid of his customers, whereupon on defendant, named Amos said, “What about the drink?” I refused to have anything to say, so the landlord said, “Drink up,” which all the defendant present did with the exception of Mr. Ralph. They then left the house. I called in P.C. Blackholt and placed him in charge of the glasses and proceeded with the defendant into a large room at the back of the premises which appeared to be an ordinary smoking room and I found a number of persons assembled, and I saw in front of two male persons intoxicants. The other had glasses of ginger wine. I found a dice box on the table with three dice. P.S. Pay reported that he had dealt with the defendants present, so I asked the landlord to get rid of his customers again. He said, “This is a private room and not part of the licensed premises.” All present asked my permission to drink the liquor which I refused to give and the defendant again said “Drink up,” and they all emptied the glasses and left the house. As I was going out with P.S. Pay and P.C. 's Blaskett and McLeod the defendant said to me, “I am glad it has happened. I am fed up with this after hour business. It ruins my health, but what can you do? They come in and say ‘If we can't get it here we will go somewhere else and get it' I know it will be serious for me; but have a drink Inspector – won't you have one with me?” I refused. I caused the glasses to be collected and brought to the Police Station. Cross-examined: he had held the licence about two years. Do you know anything about his previous history? I know what has been going on. If you are not going to give your evidence fairly I am going for you. I don't want to prejudice the case. What have you got to say about the defendant's statement, if it is true, that if a man could not get a drink here he could get it at another? It would be a grave reflection on the Police. I should take steps to stop it. Mr. Hardman: neither do I believe it. It was first watched at 10 o'clock. He went down at 10.23 and saw two people leave. No one left at 10 o'clock. The door was opened promptly and there was no hesitation in taking them to the smoking room. He did not ask anyone how they got the drink. They gave their names freely. He did not give permission for them to drink up as he was not going to be a party to an offence. Mr. Hardman said he would give him a present of the fact that they were drinking and the fact that they did it openly strengthened his case that they were guests. Further examined. He was not surprised to find another party in another room as he had seen them from the back wall at a quarter past ten. You found a dice box! There is no charge of gaming? There again you say, “There is no charge.” I do not know if you are giving your evidence as fairly as you can! Have you a dice box in your house? I have one in mine. Even if it is a licensed house it is not a criminal offence! You know it is not. Further examined. He did not know if any of the defendants were friends of this defendant. You know as a Police Officer there is no bounds as to what a man will say when about to be charged. The majority of us get “rattled” and say foolish things and whatever the statement made at the end, so far as the prosecution goes it is the only tittle of evidence before the court. I cannot say; it is a matter for the Bench. Mr. O'Meara: You have only his word about this friendship! P.S. Pay corroborated. He said that he heard a noise in the other room and opening the door saw the defendant's daughter go from the back room to the bar and he told Inspector Leeming what he thought was taking place. He fetched in P.C. McLeod and in that room they found eight persons. Two defendants had three glasses of ale, another white port and the rest ginger wine. He found out that Kitty Wyatt was in charge of the room and he cautioned her and all the rest. The white port belonged to her. When the landlord came in with the Inspector he reported what he had done and the defendant was told he would be reported. He confirmed the statement made by the defendant when they were leaving. P.C. Steele said that he kept observations from 10 to 11.30. At 10.05 p.m. he saw three men enter and at 10.12 three left. At 10.20 three more left and one was admitted. At 10.25 he kept observations on the rear of the premises until 11.30. Mr. Hardman said that there was no question of sale and all the Bench had to decide was whether the people were bona fide guests. It rested on the prosecution to conclude the fact that they were bona fide guests. There was no concealment. This house was almost under the shadow of the Police Station and anyone who broke the law so close to the station would have to be very careful to get away with it. If it was true it was nothing short of madness to have 16 people on the premises. Defendant had served 25 years in the 7th Dragoon Guards and left with the rank of Lieutenant on disbandment. Twenty four years were served abroad and he had nine decorations. With this character behind him and his living at stake would he risk it in the mean and petty way suggested? Defendant gave evidence. His wife was a Dover lady and he had been in Dover four years. On Saturday, January 12th at 9.30 p.m. there were persons in all departments of the house. He saw Mr. Mack, who asked him to change a cheque for £2 2s. 4d. and he asked him to come afterwards and he would give him the cash. Mr. Saunders was with him and they left. They returned about 10.20 and he asked them to have a drink in the smoking room. He produced his payment-in book showing the payment in of the cheque. After they went at 9.30 there were 15 to 20 in the smoke room and about 9.50 he went to Mr. Killiner, Mr. and Mrs. Amos, Mr. and Mrs. Ralph and Mrs. Redfern and asked them if they would care to stay and have some music (meaning the wireless) and the others had gone and they agreed. He asked each individually, and quietly. In the private room he asked the persons there and they said they would. At 10 o'clock he closed and everyone went except those he invited. He cleared the bar of glasses to wash up. He then asked the six people in the smoke room to have a drink. No drink was paid for after ten but he supplied them free. His daughter went to the private room to ask them to have a drink with him. In doing that she made the mistake of taking three bottles of beer instead of two, one being intended for him. At 10.20 Mr. Mack and Mr. Saunders returned. There were no others let into his house after 10 o'clock. He was in the private bar when the bell rang again and he could see through the glass who it was. He immediately opened the door and invited the Police in. he told the Inspector they were his guests and there was never any suggestions by the Police that anyone else paid for them. In regard to the conversation he would like to say that the Inspector never warned him that anything he said would be used against him. What he did say was “It had happened and this night business is very tiring and wears you out.” Mr. and Mrs. Ralph lived opposite and they visited each other. Mr. Killiner was a fellow Buffalo, Mr. Mack he had been away with for the day several times and the dales introduced Mr. and Mrs. Amos and Mrs. Redfers to them and he had known these two or three years. The Dales were close friends of his daughters. Cross-examined: There were about ten who left at 10 o'clock. The Policeman's statement could not be true as to people leaving, as he was full up. I do not want to be personal, but are you a man of means? No, far from it, or I should not be keeping licensed premises. I always was under the impression that it was a good thing to keep licensed premises! There is competition in Dover. Is that what prompted your statement to the Police that they would get it elsewhere? Cross-examined: The cost of the drink was trifling, about 3s. he could not afford that every night. What do you mean this night business is tiring? I meant stopping up every night it was tiring. Does not it suggest that this was occurring frequently? Mr. O'Meara: It does to me. Defendant was questioned as to the addresses of the persons there and said he knew where all lived. All these people are only acquaintances! In reply to the Chairman, the defendant said that he could have changed the cheque from the till if he had looked at the cheque, but he thought that it was a larger amount and that meant going upstairs to the safe. Anything between thirty and forty people left the house after ten. George Roger Mack, said that the drink was supplied by Mr. Wyatt, who was a friend of his. Cross-examined: He was a slater and tiler. He had known the defendant well since he took the house. Thomas Henry Killiner said that Mr. Wyatt gave him the drink. He was a Buffalo and so was Mr. Wyatt. They had had a lot of business together in connection with it and there was a close friendship between them. Cross-examined: He did not make a habit of being there on Saturday nights, but he had occasionally been invited to stay late and had supper. Albert Richard Boxall Amos said that he and his wife had a drink in front of them when the Police came in. It had been provided by Mr. Wyatt. Mrs. Redfern was with him; she was his sister-in-law. He got to know the defendant partly through the Buffaloes. Cross-examined: He had stopped behind about three times before and had supper. He had a pint of beer. He could drink it in ten minutes or half an hour. Mr. Hardman said that he could keep calling witnesses until 3 o'clock, but he did not propose to. Miss Wyatt said that the bars were pretty full before 10 o'clock. Cross-examined: There were about 20 there. She was in the bar cleaning up until 10.15. No friends of hers were let in after ten. Afterwards she went upstairs and came down, and saw the Police, as she was getting some water. She did not go near the bar. The only drink she served after ten was two small bottles to Harry and Charlie Dale in the private room. They were alone. She did serve some ginger wine because her father asked her to find out what they wanted. It was before 10 o'clock or at 10 o'clock. She brought out the third bottle by mistake. P.C. Steele, recalled by the Bench, said that he did not see anyone leave the house between 10 and 10.05. Mr. Hardman said that the fact that all landlord's clocks were fast probably accounted for that. The Chairman, after the Magistrates had been about ten minutes, said: The Bench have decided to convict and the fine will be £3 on each summons, a total of £20. Mr. Hardman asked if the Bench were disposed to express an opinion as to the defendant continuing to hold the licence! The Chairman said that they wanted to be quite fair. Was there anything in the past in reference to this house? The Chief Constable said that he had occasion to have the defendant cautioned before but that there had been no occasion to report him. He realised it was a serious thing for a man to lose his living but it was necessary to bring it before the Court. So far as he was concerned, if he conducted his place properly in future he did not see why he should not carry on. The Chairman said what the Bench did was not in any way to prejudice Mr. Wyatt in the authorisation of the business provided he did so in a proper way. If they could help him to maintain his business they would do so. The summonses were then taken against the ten defendants for consuming and all pleaded not guilty. Mr. De Wet defended Mr. and Mrs. Ralph. Inspector Leeming gave similar evidence. Defence Mr. Ralph was one glass partly full of ale. One glass full of port wine was in front of Mrs. Ralph, and the other had glasses of beer or ale. 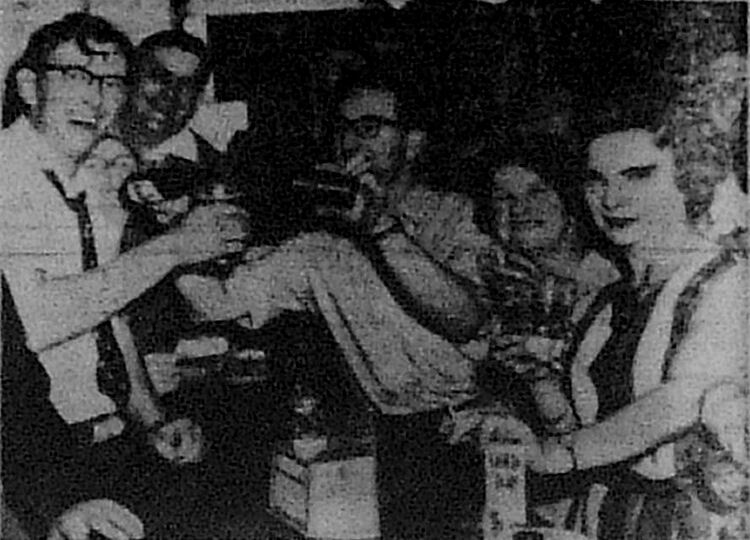 When he advised the landlord to get rid of the customers, Mr. Amos said, “What about the drink?” All the defendants, with the exception of Mr. Leslie Ralph drank up. In the other room Charlie Dale drank up the contents of two glasses of ale and the other the other one. Cross-examined by Mr. De Wet. He did not ask what had been in Mrs. Ralph's glass because it was empty? P.S. Pay said that the Dales said they ordered them before but refused to say who paid for them. One of the persons in that room said that he had ordered it a quarter of an hour previous and others said that they had not yet paid for them. Cross-examined: he did not leave at 10 as he was waiting for his wife. You did not become impatient? Mrs. Ralph corroborated. She said that her glass was empty and she did not consume any after hours. Mr. Killiner said that he thought it was before ten minutes to eleven as they were outside in the street by seven minutes to eleven. Mr. Mack said that he was invited to have a drink by the landlord when he arrived. The Magistrates' Clerk: You consumed it? The Magistrates' Clerk: That's sufficient. Mr. Mack said he thought he ought to pay any fine allotted to Mr. Saunders as he was responsible for him being there. Each defendant was fined 10s., the Chairman remarking that they were dealing very leniently with them as the maximum penalty was £30. The case lasted until 3.30 p.m., nearly four hours. The following transfers of licences were granted, the "Salutation,” Biggin Street, from Mary A. Hunt to Thomas Thomas Ames, late of the "Shanty" St. Mildred’s Rd„ Cliftonville, Margate. From the Dover Express and East Kent News. 3 February 1939. R.A.O.B. (Royal Antediluvian Order of Buffaloes). Dover Patrol Lodge.- Members, wives, and friends are cordially invited to attend an Open Night of the above Lodge, to be held at the Salutation Inn, Biggin Street, Dover, Monday February 13th. Dover Express 5th April 1946. At Dover, on Friday,, before Mr.W.L.Law, presiding, Messrs. H. E. Russell, C. E. Beaufoy, C. Byford and W. J. Pudney and Mrs. Binge. Thomas Crichton Walters, aged 27, a Pte. In the ACC (Army Catering Corps) stationed at Old Park Barracks, pleaded guilty to breaking a window at the “Salutation” public house, valued at £1, on 28th March. Defendant said he had had a lot of drink and did not remember breaking the window. Police Sergt. Reid said that he was on patrol shortly after 10 p.m. on March 28th when he heard the sound of breaking glass and saw defendant running towards the “Prince Albert”. Witness had to dive at his legs to catch him. An Army officer said that defendant had never been in any trouble in the Army. He was due to go on leave and, with his friends, went into the town to celebrate. Apparently, they had not been in the Army long enough to know how to celebrate properly without getting into trouble. Fined 10s and £1 damages. From the Dover Express and East Kent News. 14 June, 1963. When the new-look Biggin Street is completed, a two-storey lock-up shop will stand on the site which has been occupied by the Salutation Inn for more than 300 years. The new pub replacing the Salutation, will be 20 years further along the street. Dover Magistrates were told this on Friday when it was announced that terms had been agreed between the licensee, Mr. Charles Victor Townsend and the brewers. Mr. Girling, for the brewers applied successfully for a provisional order for the removal of the Justices' licence for the inn. Opposition to the application by Mr. Townsend had now been withdrawn, he said. The licensee would be recompensed as the tenancy would be terminated earlier than had been anticipated. A further application for an order for the final removal of the licence - will have to be approved by the magistrates before it's a case of "Time, Gentleman, Please!" for the last time. From the Dover Express and East Kent News. 9 August, 1963. CLOSING NIGHT AT THE OLD SALUTATION. Time, gentlemen please!" ... for the last time at the Salutation Inn on Monday night. Twelve hours later the demolition men moved in. Time ran out for Dover's ancient Salutation Inn on August Bank Holiday Monday, when licensee Mr. Charles Townsend called for last orders. For over three hundred years the Salutation in Biggin Street has provided rest and refreshment for travellers between Dover and Canterbury. The premises and the line of shops in which they stand are being demolished to make way for a £100,000 redevelopment scheme. There was a touch of sadness in the three bars as they sang "Auld Lang Syne" at closing time. "I've made this my local for twenty years," said the old man in the corner. "Now I'll have to scout around to find another place with the same atmosphere as the Salutation." A big crowd gave "The Sally" - as it is called - a good send off. 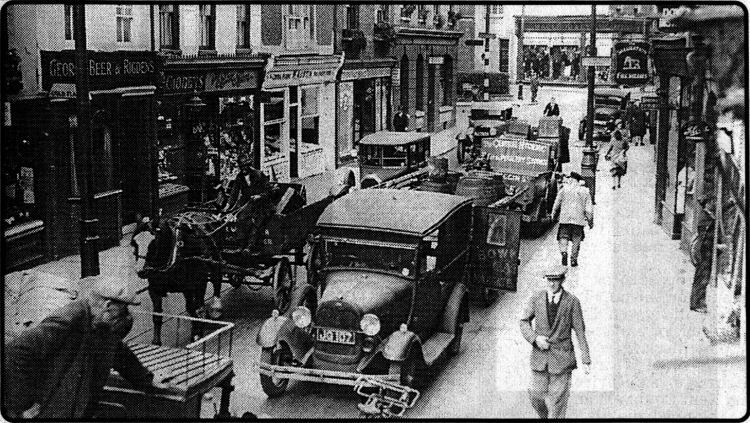 One there for the final hour was Mr. John Ullmann, of Dover Demolition and Erection Company, whose firm i to knock down this sector of Biggin Street. Work began early next morning gutting Fletcher's butcher shop, which is next door to Scrase's electrical store, still being vacated. 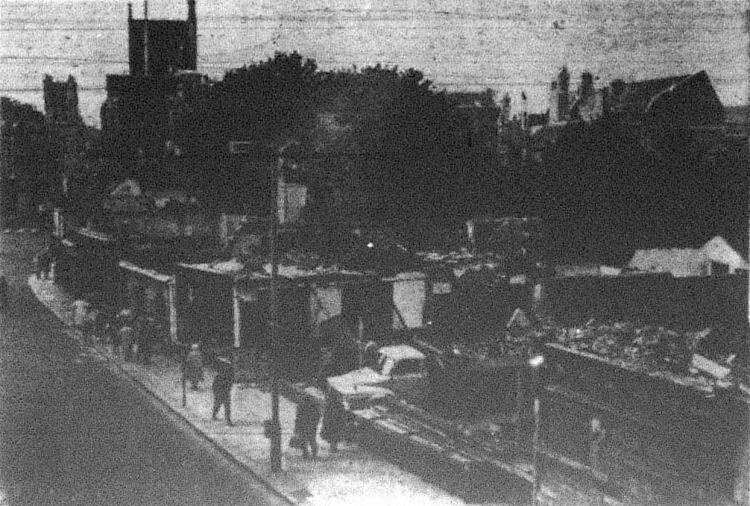 Almost immediately after the area has been cleared, two-storey shops are due to be erected. A new Salutation will be built in the block. It is hoped that the reconstruction of the area will be completed by next June. Later, it is planned to build a telephone exchange at the rear of the shops. From the Dover Express and East Kent News. 30 August, 1963. The demolition squad at work in Biggin Street bottle-neck. From the Dover mercury, 10 August 2001, by Joe Harman. 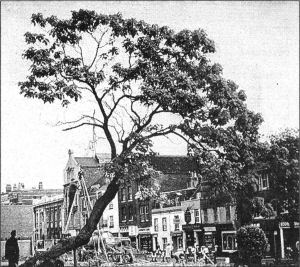 THIS picture was taken during the last days of the Catalpa or Bean tree which had flourished outside Maison Dieu House for many years. 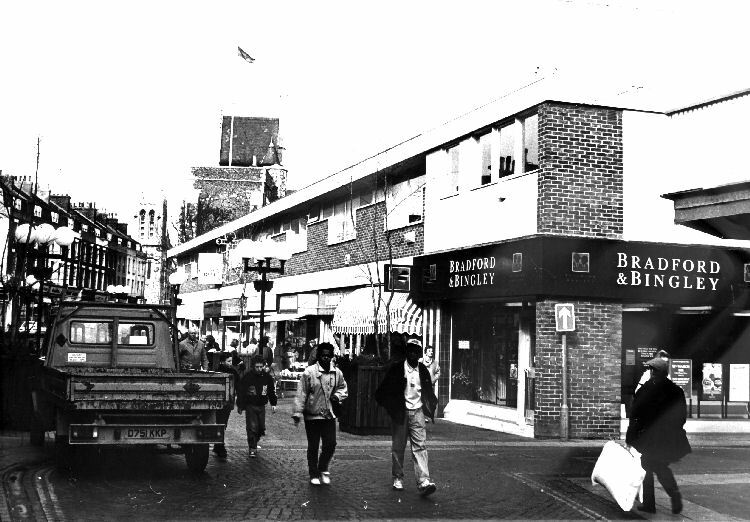 In 1963 it was decided to redevelop a part of Biggin Street. This included Hoare Gothard and Bonds, Pearks Stores and the Salutation. The Salutation would have been out of the picture on the left. 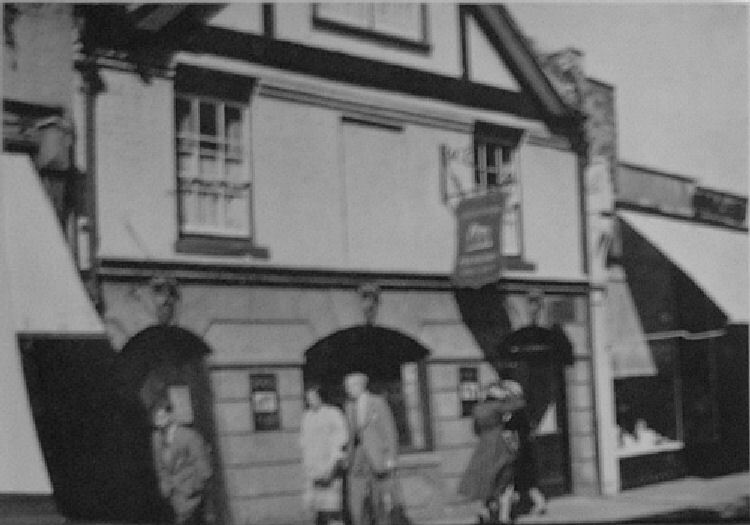 The old Inn was rebuilt further down the street, but it never regained its former glory and is now a building society office. You can see some of the properties on the other side which were later improved, and included the British Queen (slightly right of centre of picture), Giddens the watchmaker, Crush the tobacconist and Parks the fruiterer. Photo by Stuart Kinnon, 1983. The former Salutation as it looks today. (2000ish) Although precise date unknown, the building work on the right may be able to date this. The original was said to exist with the nearby monastery in the twelfth century. One writer has suggested that the two were connected with a tunnel or passageway. The monastery would have been much closer then than the few remaining portions of today so I find that suggestion easy to go along with. Its name before the Reformation was probably "Annunciation" or possibly "Angelus" if it was present then. The sign would have changed when the Priory met its demise with perhaps just the lily remaining. 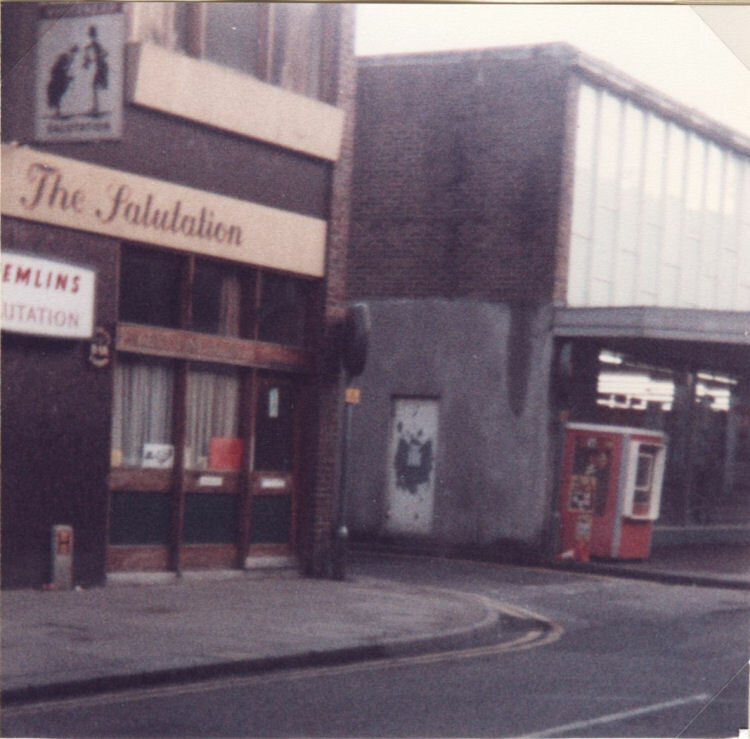 It has been reported that when the pub was called the "Annunciation" that the sign depicted the greeting of the Blessed Virgin Mary by the Angel Gabriel. When it closed on 5 August 1963 others estimated it to be some three hundred years old. I can only say here that J. Bowes kept it in 1791 and a Mr. Bowen is known to have died there in 1794. I do recall that it was necessary to step down into the public bar so it was easy to fall into as it were. It was removed in 1963 when it became necessary to widen the pavement. Another of the same name was then built on a corner some sixty feet from the first site. It opened on 4 September 1964. The new black and white sign, depicting two figures was uninspiring and suggested little to the average person. The structure itself could hardly have looked less like a pub from the outside. Needless to say, it fought a losing battle for nineteen years and closed finally on 6 December 1983. 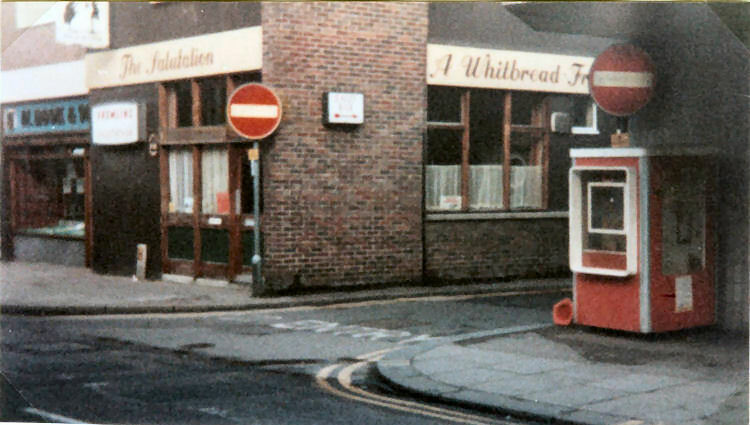 It was a Whitbread outlet. Following alterations. 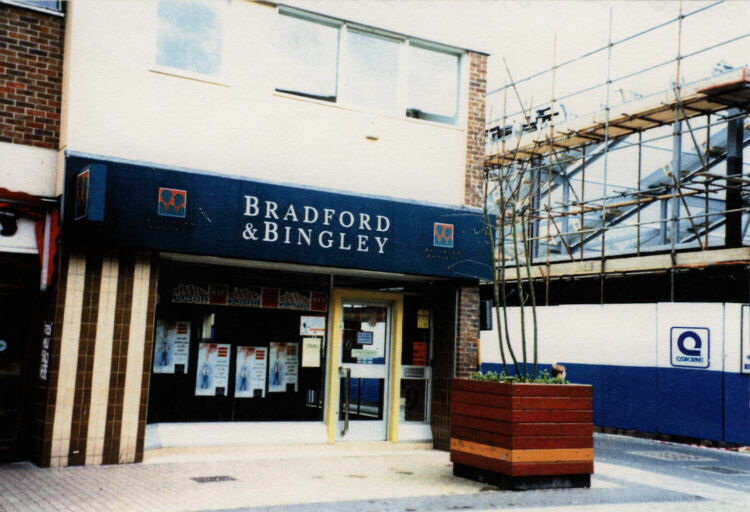 Pizza Hut (UK) utilised it as a licensed restaurant but their stay was briefer still, lasting only seven months before giving way to the Bradford and Bingley building society. According to the Dover Express, John Botley was from 39, Cheriton Road, Folkestone, formerly licensee of the "Ship," Minster. Thomas James Harte was previously from Southampton, Hotel Surbitan, cellarman. Frederick John Gillespie may well have been landlord of the "Fountain" in Hastings in 1918.